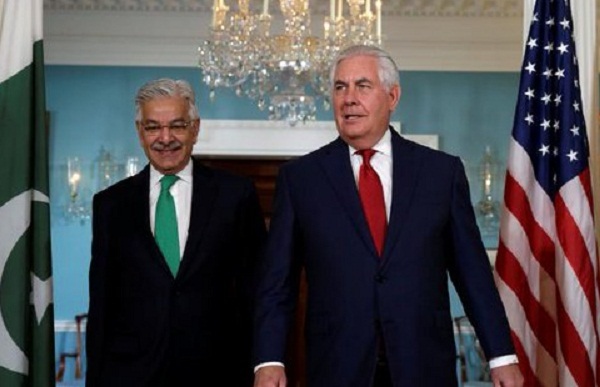 WASHINGTON - U.S. Secretary of State Rex Tillerson said on Wednesday he believes Pakistan is a reliable partner — the Pakistan relationship and the U.S. relationship is extraordinarily important regionally. Rex Tillerson made a statement from the Treaty Room of the State Department. A reporter asked '' Do you think Pakistan is a reliable partner?''. Secretary Tillerson said '' Yes, I believe we do. I think the Pakistan relationship — the Pakistan relationship and the U.S. relationship is extraordinarily important regionally. And as we rolled out the South Asia strategy, we spoke about it in a regional context. It is not just about Afghanistan''. Rex Tillerson said this is about the importance of Pakistan and Pakistan’s long-term stability as well. We have concerns about the future of Pakistan’s government, too, in terms of them — we want their government to be stable and we want it to be peaceful. And many of the same issues they’re struggle with inside of Pakistan are our issues. ''We think there is an opportunity to strengthen that relationship. We’re going to be working very hard at all levels, from the State Department to the Defense Department to our intelligence communities, as well as economic, commerce opportunities as well. So it really is a regional approach and Pakistan is critical, I think, to the long-term stability of the region'' Tillerson said.